Consider a binary mixture of 40 mole% benzene and 60 mole% toluene at 760 mmHg. This biphasic mixture is fed to an isothermal flash vessel in order to separate the vapor and the liquid phases. The flash temperature is such that ... if ... and ... is equal to a user-set value for ... . It is assumed that the flash has a constant liquid molar hold-up, the operation is isothermal and isobaric, the liquid and gas phases are ideal, and the vapor molar hold-up is negligible. 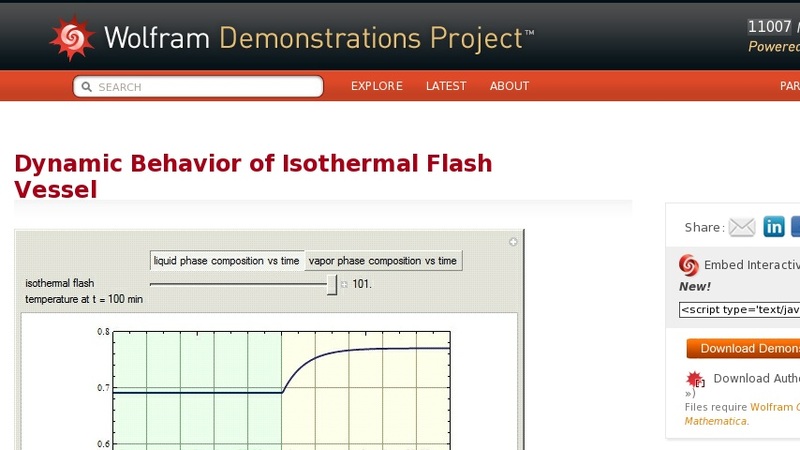 This Demonstration plots the liquid and vapor phase compositions versus time and shows the dynamic behavior of the isothermal flash vessel when it is subject to a step in the operating temperature. Initial and final compositions and vapor fractions are displayed in both figures.